A belt and disc sander is a machine used to sand down wood and other materials to shape it and for finishing purposes. 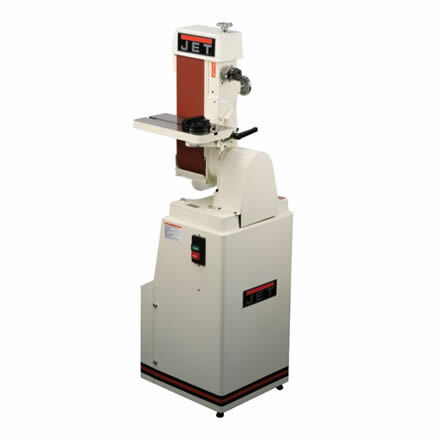 The belt sander consists of a seamless sanding belt that fits over a pair of cylindrical drums driven by a motor. The disc sander is a round disc usually 9" to 12" in diameter but some are smaller and others much larger, attached to a motor shaft. On a stationary belt sander the work rests on a table or against a stop and is pushed against the sanding belt. Stationary belt sanders are usually mounted on a bench or stand. Some larger units have the base built into the machine. Sometimes stationary belt sanders are combines with a disc sander that uses the same motor to power both. Stationary belt sanders are used for removing wood, plastic, and non-ferrous metals, such as aluminum. They are sized by the width and length of the sanding belt and the size of the motor. A typical belt sander will have a 6 inch wide belt that is 48 inches long, known as a 6" x 48" belt sander. A disc sander is also used to sand down wood for shapring purposes and for prepare it for finishing. A disc sander is nothing more than a disc attached to the drive shaft of a motor. Disc sanders are measured by the diameter of the disc and the size of the motor. A typical disc sander like the one manufactured by Delta was a 12" disc with a 1 HP motor. Some disc sanders are as large as 20" or 30" in diameter. Disc sanders usually come equipped with a table upon which the stock rests and is guided into the rotating sanding disc on the downward side. The sanding table usually comes with a groove in it for a standard miter gage that can be used to help sand angles.